My great grandfather moved to the farm in 1919 and we've made maple syrup every year since, without ever missing a year. I am the fourth generation in our family to do it! This is our Sugar Shack that my Great Grandfather designed and my Grandfather built by hand. 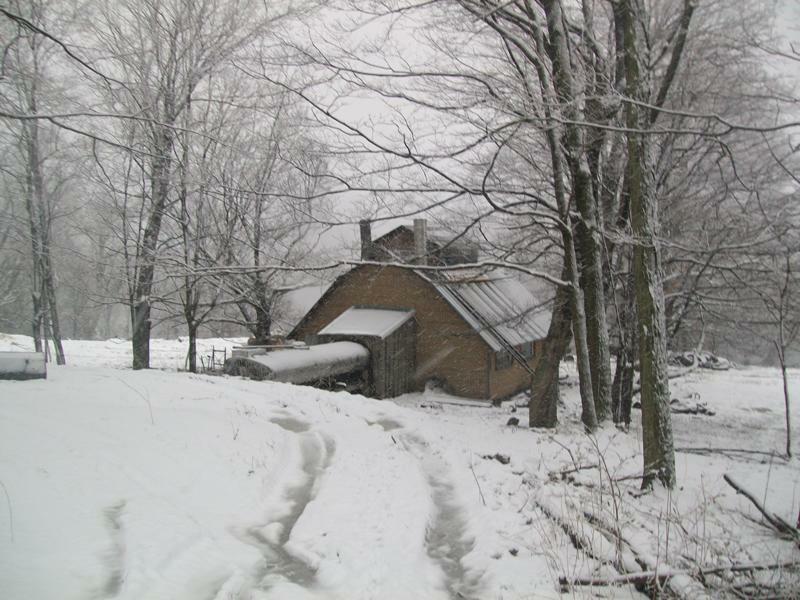 We still use this beautiful building every spring to make our delicious maple syrup! Since I strongly believe in the local food concept, I won't ship any of our food products out of the local region - with one exception - maple syrup. That's because production is limited to the northeastern part of the US and Canada. Since maple syrup is only specific to this region I am willing to ship so that many people from different regions can taste and enjoy maple syrup! What is considered the "local region"? Any location within a four hour drive of Sugar Haven Farms I consider to be in my "foodshed". All other products can be found by seeking similiar farmers that are outside my "foodshed". (similiar to watershed, a regional area that I proudly call home). Fortunately, the busy time for making maple syrup - often in mid March through early April at this high altitude - is a fairly quiet time on the farm. Sap typically runs for about three weeks, but the starting time varies from year to year, so we have to watch the weather patterns carefully. In fact, our farm is fairly high, with an elevation of about 2,100 feet above sea level, so our maple syrup season often starts after the lowlanders are completely finished. We tapped 1,600 trees this spring! We're more concerned about tree health than production, so most of our trees get a single tap, while some of the larger trees can handle two taps. We never overtap our maple trees which would cut down on the life of the tree. 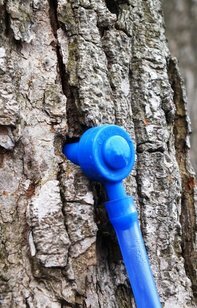 To collect the sap, we use vacuum and maple pipe lines. There are 5/16" diameter plastic tubing lines that run to 1" main lines. We switched from 7/16" taps to 5/16" taps about five years ago because the smaller diameter taps is better for the trees. Tap wounds completely heal in about three years and there are no long term effects on the trees. It takes about 40 gallons of sap to make one gallon of maple syrup, so it requires a lot of trees to have even a small maple syrup business. Sap is usually only 2 percent sugar. We boil it down until it is 66 percent sugar, using wood as our heat source. Wood is renewable and burns hot enough for the sap to caramelize, giving it that sweet maple flavor. The sap is boiled on two separate arches with each arch having their own drop flue pans. Arch number one is four feet wide and fourteen feet long with three pans set up to finish the sap into maple syrup. Arch number two, also four feet wide and fourteen feet long, is where raw sap is brought in and heated up before being transferred, by gravity, to arch number one to be finished into the final product. This system allows us to boil off 300 gallons of sap an hour creating the distilled maple syrup we love! This works out to about 7.5 gallons of maple syrup an hour when both arches are running at top efficiency. Unopened containers kept in a cool, dry place are good for years. Once opened, they should be refrigerated. Maple syrup is around three times as sweet as regular sugar with fewer calories and a lower glycemic index. It can replace white cane sugar at a ratio of 3/4 to one up to as high as one to one, depending on the recipe. It's absolutely delicious with cooked ham, and on ice cream, waffles, pancakes, french toast and sausage, not to mention oatmeal, sweet potatoes and squash. Maple syrup a natural product produced in a way that leads to profitable, sustainable forestry. It's an antioxidant powerhouse, filled with at least 54 anti-inflammatory and antioxidant compounds. It also contains essential nutrients like zinc, iron, calcium, and potassium, keeping the heart healthy and boosting the immune system. So if you're looking for a great tasting, natural sweetener with lots of beneficial nutrients, you can't go wrong with our maple syrup. You can place an order right from our site.